As true replacements for 250W and 400W metal halide lamp floodlights, ENSIO Outdoor Integrated LED Floodlight with water resistance at IP66 rating and vandal resistance at IK08 rating provides superb brightness and gives instant light with a homogeneous illumination and perfect for outdoor floodlight applications such as signage, billboards, gated areas and façade. Available in 90W and 180W options, the ENSIO integrated LED floodlight delivers superb performance up to 122lm/W and has a substantial 50,000 hours lifetime. It can operate in ambient temperatures ranging from -30℃ to +50℃. 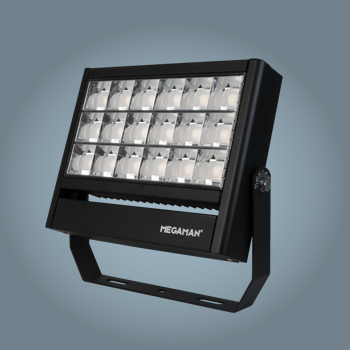 The virtually maintenance free floodlight provides both cost and manpower savings. The ENSIO series offers symmetric and asymmetric options for uniform lighting, its louvre optics design delivers highly focused light beams, low glare and enhanced photometric control. With fully adjustable 180 degree joints, you can project the light at different angles.